This weekend, the New York Times published an opinion piece by Andrew Hacker, emeritus professor of political science at Queens College in CUNY (sister college to where I teach). The piece is titled "Is Algebra Necessary?" and seems to make the argument that an algebra requirement should be waived for most students in American high schools and college. Obviously, on a nearly daily basis, my job deals directly with the pain and death-march scenario of a majority of students coming into our community colleges and being unable to pass the equivalent of a 7th-grade algebra course. I do think that for all of us -- even myself -- proficiency at math is almost always the limiting factor in our careers. At the same time, it's almost uncanny how many old friends I have getting in contact with me to say that they've suddenly found a higher level of math really key to their professional advancement -- including psychologists, photographers, and even artists (mentioned in Hacker's article as a group that should clearly be freed from a math requirement). Let me riff on that last point for a bit. My girlfriend is a fine artist, with an MFA in sculpting from a school here where we live in New York City. Earlier this year, she was the recipient of a month-long artist residency in Taiwan where she put together an outdoor installation in knitted recycled plastic as part of an exhibit on environmental themes. She has a fairly high proficiency at math (in fact, for about a month she was a math major in college before switching), and this gets used routinely in her career. She has to estimate volumes of complicated shapes she's planning to put together, so as to procure materials (plastic, wire, plaster, etc.) She has to do calculations with money so as to set budgets and write grant proposals. She has to estimate time for projects that might last many months. At some point she generated a calculation for people, time, and material to cover the Eiffel Tower in tiny crocheted plastic leaves (a long-term goal). And as I know from several friends working as graphic artists (such as from my time in the video game industry) -- almost all of the work today is done on computers anyway, so they need proficiency with numbers, computer science, (x,y) coordinate systems, algorithms, etc. in order to interface with the most basic professional workflows nowadays. On the side, my girlfriend also runs a home business coding HTML and hosting websites for other artists, and last week was learning for the first time to hack in a UNIX command prompt in order to apply software patches. Such is the life of an artist in the 21st century. I WANT to end on a positive note. Mathematics, both pure and applied, is integral to our civilization, whether the realm is aesthetic or electronic... Instead of investing so much of our academic energy in a subject that blocks further attainment for much of our population, I propose that we start thinking about alternatives. Thus mathematics teachers at every level could create exciting courses in what I call “citizen statistics.” This would not be a backdoor version of algebra, as in the Advanced Placement syllabus. Nor would it focus on equations used by scholars when they write for one another. Instead, it would familiarize students with the kinds of numbers that describe and delineate our personal and public lives. It could, for example, teach students how the Consumer Price Index is computed, what is included and how each item in the index is weighted — and include discussion about which items should be included and what weights they should be given. So, what do those symbols mean? What is the proper order of applying those operations? (Noting that approximately half of my remedial algebra students end a semester unable to answer a final exam problem to apply the proper order-of-operations in several steps.) Any of these disciplines, and even a simple CPI calculation is a great example, presume that educated readers have the grammar of algebra (I think that's what it's most like, really) available to converse with. The only other option is to mount a crusade to expunge this writing from professional resources -- and in so doing, bring those disciplines to a grindingly slow level of inefficiency and lack of progress. 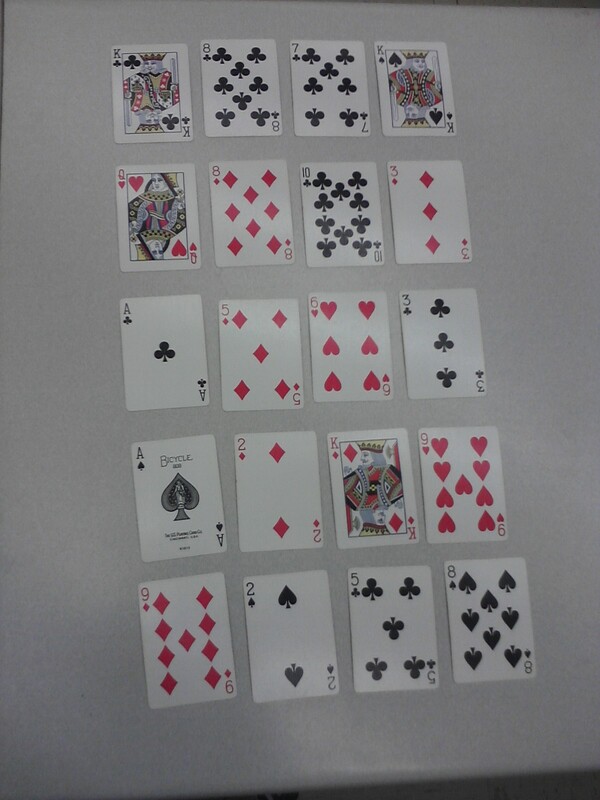 Estimating the Mean Rank of a Deck of Cards by Sampling a Hand of 4. 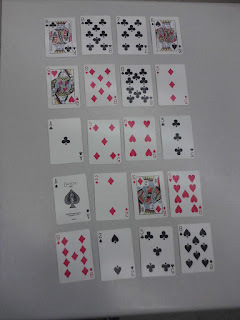 Consider: Deck of cards (ranks A=1, 2-10, J=11, Q=12, K=13). Estimate mean of all card values; obtain 80% C.I. for μ & interpret. Sample size n=4; stdev σ=3.74; population uniform. Interpret: There is an 80% chance that the mean of all card values is in any given interval. We expect roughly 0.8×5 = 4 intervals to contain μ; check & lessons. 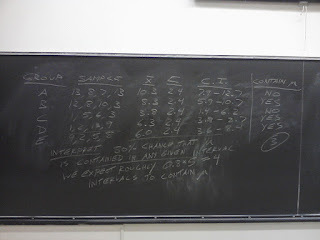 Hopefully you can see what I'm talking about -- time-permitting (takes about 50 min if I'm not rushing), I find this to be excellent and highly memorable way to reinforce the conceptual lessons of confidence intervals one final time. Frequently I get some students literally gasping in surprise that that population mean, μ, of the deck of cards is actually contained in most of the C.I. 's (as incredible as it may sound -- given that's the whole point of the procedure). Most intervals contain μ, but not all. The margin of error E is fixed by the chosen sampling process. The population mean μ is a fixed number (but generally unknown). The probability statement is about the C.I., not about μ. The procedure is robust even when breaking the assumptions somewhat. 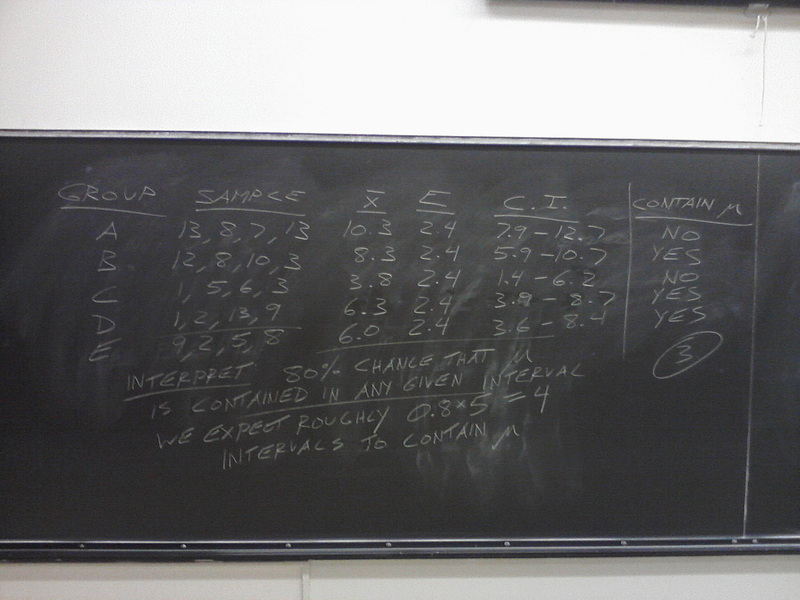 This is probably my favorite, and most incredibly useful, extra demonstration that I do in any of my classes. Highly recommended if you have a chance to try it out yourself. In a basic algebra class, we teach the "rules of exponents" and the "rules of radicals". Altogether, this usually appears in the form of 14 or so separate symbolic rules (and maybe more if you're careful to point out common simplifying errors to avoid). I've taught this in a rather dramatically different way for several years, in a manner which collapses all the different rules to just two major principles. This is based on some observations I made which seem pretty trivial in retrospect, but I find them to be useful -- not a panacea, but they get some traction from students, and better convey the deep global applicability of math (not a big list of disjointed rules to memorize). At this point, I tend not to even see what I'm doing as something unusual, but I showed it to a friend of mine the other week who has a PhD in Molecular Biology, and she exclaimed, "I was never taught it that way! ", and seemed quite delighted. (To my knowledge, really, no one's ever taught it this way, since it's a method I developed -- for what that's worth.) I've mentioned it in passing before but I figured I would highlight it clearly here today. Of course, the details are important: Parentheses means "operations inside parentheses" (and includes other grouping symbols like braces, brackets, fraction bars, radical vinculums, and absolute values). In any phase of calculation, we work left-to-right across the expression (just like we read), calculating any of the given operations as we encounter them. Note that after parentheses, each operation comes paired with its inverse (tied in order of operations). As we do exercises, I'm careful to verbally model the mental process: "Do we have any parentheses? No, so we don't need a written line for that. Do we have any exponents or radicals? Yes, so we'll need a written line for that..." Etc. Principle #1: Operations on same-base powers shift one place down in OOP. I now call this the "Fundamental Rule of Exponents". Ex. #1: Simplify (x3)2. Think: I have a power (x3) and I'm exponentiating it (raising it to the power 2). What is my shortcut? Find "exponent" in the order-of-operations and shift one place down and you see our shortcut: multiply the powers. So (x3)2 = x6. Ex. #2: Simplify x5/x3. Think: I have same-base powers (both base x) and they are being divided. What is my shortcut? Find "divide" in the order-of-operations and shift one place down: we will subtract our powers. So x5/x3 = x2. Stuff like that. You can do more initial examples based on student inquiry or interest; of course, it also works for multiplying and radicalizing same-base powers (shortcuts to add and divide, respectively). Maybe weaker students wind up having to memorize all four implied relationships anyway, but I think that's okay. It gives everyone a framework for truly understanding the relationships between operations when they need it. Principle #2: Operations distribute over any operation one line down in OOP. I now call this the "General Distribution Rule". So what I mean here is that (as I explain in the lecture) you've got parentheses, with one operation outside, and another operation inside. The observation is that we have a very nice, one-line shortcut to get rid of the parentheses by applying the outside operation to each piece inside -- so long as the inner operation is one of the items one line down in the order-of-operations. Ex. #1: Simplify 7(x+5). Think: We have parentheses. The outside operation is multiplication. The inside operation is addition. Since the latter is one line down in OOP, we can distribute this: namely, "distribution of multiplication over addition". (Note that the "over" in the official name echoes and recalls the relationship in the OOP picture.) So 7(x+5) = 7x+35. Ex. #2: Simplify (a2b3)2. Think: Once more, we have parentheses. The outside operation is exponentiation. The inside operation is multiplication. Again, since the latter is one line further down in OOP, we can distribute this in a one-line shortcut -- "distribution of exponents over multiplication". So, recalling the first principle for applying exponents to powers: (a2b3)2 = a4b6. Check: Ask students for a specific value for x (not zero), substitute into both sides, and check to see if they are the same value. Of course, this principle also works to recall any of: distributing multiplication over add/subtract, distributing division over add/subtract, distributing exponents over multiply/divide, and distributing radicals over multiple/divide. There's actually a total of a full dozen (12) relationships explained by this one single principle (including the fact that exponents/radicals do not distribute over add/subtract). It pays off to do as many simplifying examples as time permits afterward, but I do think that getting these two major principles on the board as soon as possible "primes the pump" for everything that happens later. It provides an overarching organizational structure, and it also serves as a model for abstract, generalized principles being easier to remember and apply (making us more happy) than a large body of otherwise disjointed rules. Which from my perspective, may be the only thing that justifies everyone taking a basic algebra course in the first place. For the last few weeks in my summer courses, I've been frustrated that I'm constantly running over time by about 5 minutes (every night in a 3-hour session). Not great, particularly when the session ends with the culminating problem of the evening, and I really want students to have time to try one while I'm present to help them out. But it has to be that way. Principle: Of everything I can do during class time, answering student questions is the most important and must be prioritized. If I'm fortunate enough to have a student who's done homework, and arrives interested and asking good questions (not all questions being good ones), then the best thing I can do is to highlight and answer those questions. That's the ultimate competitive advantage we have in teaching classes with a live, expert instructor present. I usually try to teach ways to double-check any calculation procedure (by means of initial estimation, making a graph/sketch, etc.). Frequently students resist this: they ask if they can skip the estimation step and just do the direct calculation alone. That's problematic, because it's the estimation which is perhaps the better test of actual comprehension of the overall concepts involved. New analogy: The double-check is like a backup parachute. 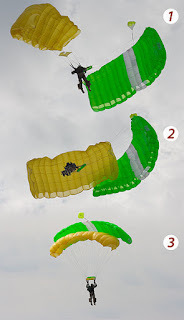 Most of the time the main parachute works, but no sane skydiver would take a leap out of a plane without the backup if they can avoid it. If they did, they'd be one tiny glitch away from total disaster. Edit: I suppose an even better analogy would be the little "drogue parachute" that is deployed for slowdown & stability prior to the main parachute (granted that estimation should occur at the beginning and only partly suggest the full answer). But not everyone knows about that, so I went with "backup parachute" instead. Recently I've been coming to the opinion that we need to teach basic logic at a young age, as was done in classical education. Ultimately, it's the foundation for all of math and the scientific method. If the first time you study logic it is in college, then all of your education is really built on shifting sands. A couple related thoughts: I'm coming to this largely because of how many of my students in any class (even sophomore statistics) get helplessly tangled up over something as simple as an if/then statement. Or a subset relationship (e.g., normal curves are bell-shaped, but bell-shaped is not the same thing as normal). Or an "and" statement (the z-interval procedure requires a simple random sample, known population standard deviation, and a normal sampling distribution of the mean... the last of which can be established by either a normal population or a large sample size). I'm reminded of my first programming book in the 6th grade which introduced "and" and "or" operators and just said, "the meaning of these should be obvious", with an example of each. It may not be a priori obvious to everyone, but it really shouldn't take very long, and could pay off enormous benefits later. And then I got Ms. Pounding Shouter... She thumped the podium, she pointed at people and accused them of not understanding her, she ordered them to believe what she told them to... "I was totally logical. I pointed things out real loud and told people they were dumb if they didn't believe it, and I yelled so they'd get the point." Last and far from least, in a related course where I used to teach listening for logic as a way of improving listening comprehension and retention, one student asked me at the end of the class, "Why wasn't I taught this in fourth grade?" Of course, to his credit John goes on to explain the vested interests that don't want fourth-graders -- or jury members -- knowing the basics of logic and reasoning.